Help reduce planned and unplanned downtime with the new integrated high availability and disaster recovery solution, SQL Server AlwaysOn. 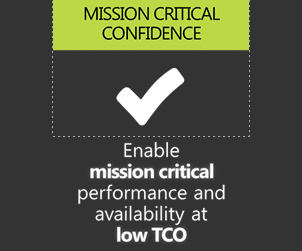 Achieve maximum application availability and data protection with options to configure active, multiple secondaries and ability to quickly failover and recover applications. Overview Make a bet on a trusted platform that continuously leads in industry-relevant TPC-E, TPC-H and real-world application performance benchmarks. Release over release SQL Server is SAP-certified to run some of the industry’s most demanding workloads. Significantly boost query performance, by up to ~10x for star join and similar queries with the new ColumnStore Index. 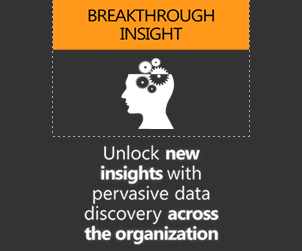 Empower end users with new insights through rapid data exploration and visualization. Discover new insights at the speed of thought with Power View, a highly interactive, familiar browser-based data exploration, visualization, and presentation experiences for users of all levels. Empower users of all levels to access and mash-up data from virtually any source, create compelling reports and analytical applications, and easily collaborate and share insight using familiar tools with PowerPivot for Microsoft Excel 2010 and Microsoft SharePoint 2010. Offload IT tasks and reduce support requests with self-service analytics tools, like Power View and PowerPivot, that scale to thousands across the organization. Gain operational flexibility with proven Microsoft cloud offerings, private or public, that deliver interoperable deployment options with SQL Server 2012. Break free and scale beyond the constraints of any one deployment environment by taking advantage Hybrid IT opportunities with a common architecture that spans traditional servers, appliances and the cloud. 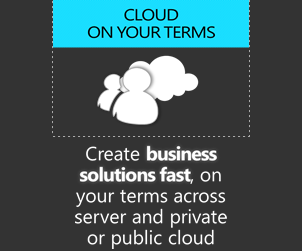 Enable new scenarios with Windows Azure SQL Database Data Sync, a cloud service that provides bi-directional data synchronization between databases across datacenter and cloud. Provide a consistent and open data-feed to power multiple user experiences across the web, devices and desktop with OData, an open protocol built on widely used web standards. Organizations today are under tremendous pressure to implement effective cost-control strategies without sacrificing growth, productivity, functionality, or flexibility. Enterprises that currently support multiple data platforms face issues of inconsistency and higher short-term and long-term licensing and service costs. As a database management solution, Microsoft SQL Server 2008 R2 provides everything an organization needs to lower its total-cost-of-ownership, manage all volumes of data from birth to archival, and provide mission-critical functionality and reliability. Which platform are you migrating from? The free Microsoft SQL Server Migration Assistant (SSMA) makes it easy to migrate data from Oracle, Microsoft Access, MySQL, and Sybase to SQL Server. SSMA converts the database objects to SQL Server database objects, loads those objects into SQL Server, migrates data to SQL Server, and then validates the migration of code and data. Why migrate from Oracle, Access, MySQL or Sybase? SQL Server 2008 R2 provides everything an organization needs to lower its total-cost-of-ownership, manage all volumes of data from birth to archival, and provide mission-critical functionality, reliability, scalability, and security. SQL Server helps you to consolidate databases, virtualize servers, compress data, allocate resources more effectively, and manage with policies.